The second European Creative Hubs Network (ECHN) skills workshop for creative hub leaders, took place in Berlin, Germany this week. Titled “How to be a Hub Superhero”, this two day event aimed to build the professional capacity of creative hub leaders, by developing tailored support and skills development tools. 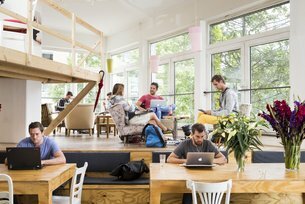 The second workshop to take place in the series, hosts betahaus, ECHN and partners set out a programme focused on creative hub leaders who have been running their hubs for at least two years. Participants explored a broad set of skills, crucial to the successful leadership of creative spaces - ranging from day-to-day management, to coping with financial insecurities, motivating employees in complex project environments, and increasing the hubs’ prominence in their respective communities. We selected participants via an open call to creative hub leaders, managers or representatives from across Europe. Through competency based training, teambuilding, exploring career superpowers, working on doubts, fears, and motivation, the workshop offered keys to hub-specific answers. You can follow the action on Twitter.